Wayne, IL- April 30 2015 - Last year Showplace Productions added another week to its popular Spring Spectacular event with great success. This year Spring Spectacular will run from June 2-21. 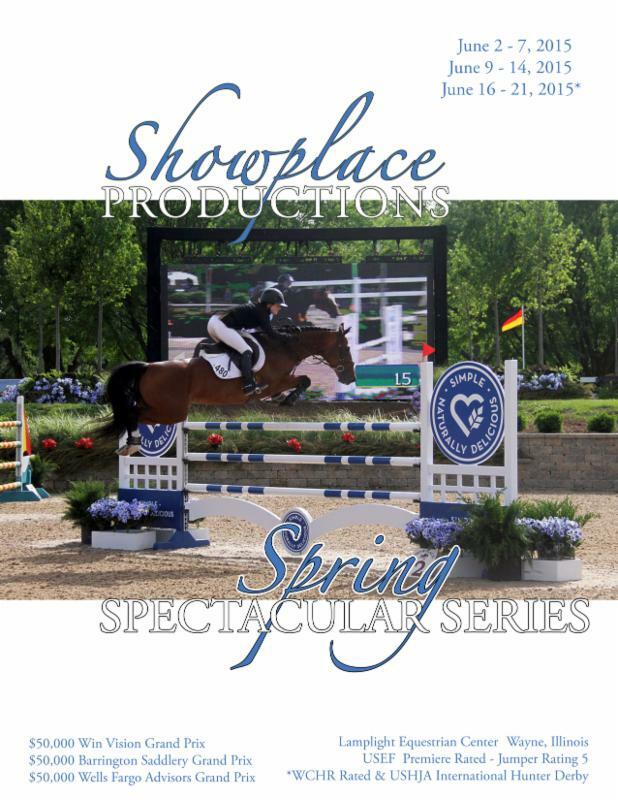 Showplace Productions has added new classes, prize money and over-the-top hospitality to make your showing experience even more enjoyable at beautiful Lamplight Equestrian Center. Showplace Productions is now offering professionals a fantastic way to show young horses in classes with no entry fees. Only the Young Jumper Championship class for each section will have an entry fee and the regular classes will be free. Free Tuesday schooling will be offered, including full jumper courses at varying heights at designated times, perfect for schooling youngsters and trying and showing prospects on the off-day of the show. Spring Spectacular will offer increased prize money in the Open Jumper and Junior/Amateur Owner Jumper sections. The Grand Prix prize money is also increased to $50,000 per week plus a $10,000 1.3M section and a $5,000 1.4M section each week. "I want to thank our sponsors without which we could not increase prize money," said Pat Boyle, owner and manager of Showplace Productions. "Thanks to Robert Scarnechia of Win Vision for their great support in sponsoring the $50,000.00 Win Vision Grand Prix. Barrington Saddlery and Assistance in Healthcare will be our week II $50,000.00 Grand Prix sponsor. I want to welcome Keith VanderVeen of Wells Fargo Advisors for hosting our Week III $50,000.00 Grand Prix." A few new classes have been added including an Accumulator class for the Junior/Amateur Owner Jumpers and an Equitation Championship to Sunday of Week III. For the second consecutive year, Spring Spectacular will hold the USHJA $25,000 International Derby as a WCHR Member event during Week III. "We invite everyone who competes in Kentucky and elsewhere during our Weeks I and II to come up and join us for our largest week of festivities and enjoy our Derby Week," said Boyle. "I know that some of you haven't been able to join us in the past because of schedule conflicts, but this is a great opportunity to compete in our Derby in the Grand Prix Ring and earn points for WCHR standings." As is the standard with Showplace Productions events, high-style hospitality will be offered during Spring Spectacular. Gene and Georgettis, a Chicago institution since 1941, will host the International Derby Day luncheon in celebration of their new location in Rosemont. Niche restaurant in downtown Geneva will host a thank you party for Spring Spectacular attendees on June 18. Regular weekly events, like dinners with music every Friday and Saturday. June is the perfect time of year to enjoy Spring Spectacular at Lamplight Equestrian Center, one of the most beautiful equestrian centers in North America. Contact us today to reserve your stalls.